My property is just under 1/4 acre and it is forced to fulfill many purposes. The buildings alone take up a third of the area and the rest has to occupy poultry, children’s toys and still offer space for my flower gardens. That is a lot of work for a small space. However, I can still produce a lot of food for my family and customers. It simply takes some planning and innovation. If you haven’t read the books Mini Farming: Self-Sufficiency on 1/4 Acre and Maximizing Your Mini Farm, then I highly recommend them. The author, Brett Markham, has created the homestead that I dream of on the same amount of land that I have. Not only that, but he’s located in New England so he conquers the short growing seasons with finesse. The way to be successful, as mentioned before, is to plan. 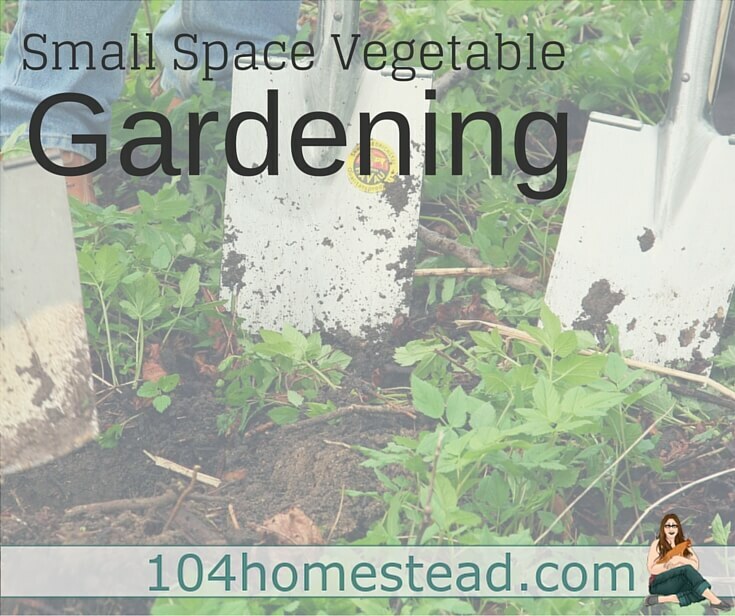 Spend time researching new and innovative ways to grow your food in smaller spaces. 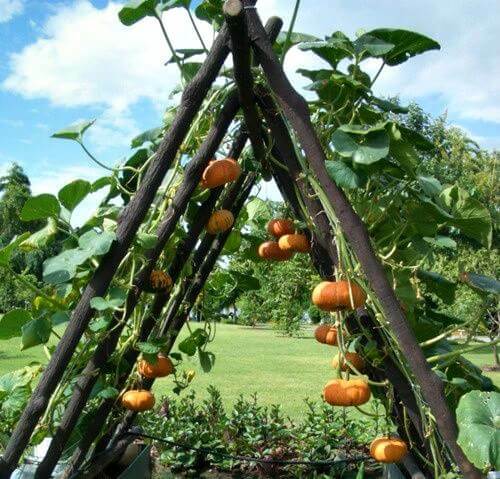 Just today someone sent me a Pinterest link about a neat way to grow pumpkins in a small area. Not only was that a genius idea but while looking at the picture I found myself thinking I could put some shade tolerant herbs under there. Click to see the pin. Much like my pumpkin dream, vertical gardens are a wonderful option. Vertical gardens grow up instead of out, saving on space. Some benefits of growing vertically include easier pest control, less waste since ripe produce is more visible, and harvesting is super easy on your back. Tomatoes, gourds, melons and vining vegetables are just a few things you can grow vertically. Container gardens are perfect when you only have a porch or patio, or you are trying to grow foods that aren’t meant for your gardening zone. Container gardens may also be your saving grace if you rent from a landlord who would prefer you not dig holes in the lawn. A bonus to container gardening versus in-ground gardening is that you have a lot more control over the soil conditions. If you have a lot of trees on your property, you can choose shade-tolerant plants for those less than ideal locations. Straw bales are a great way to grow produce if you have poor quality soil or even no soil at all. Yup, straw bale gardens can even be set up in the corner of your driveway or on a concrete slab. I have heard wonderful things about strawberry yields in straw bale gardens. Vertical gardens are the great solution for everything. They don’t need much space but they give you the comfort. I have all kinds of vertical gardening going on as well as containers. People that say they don’t have enough room to garden, are just making excuses not to garden. Exactly! Where there is a will there is a way. Thanks I have same amount of land and I am doing the same. I am learning a lot from your website. Of course I get all my food from my garden. Keep sending interesting news from your end. Great article! I have about the same amount of space as you. We have most of our yard covered in gardens and do a lot of vertical growing. I’m always looking for ways to put more in.